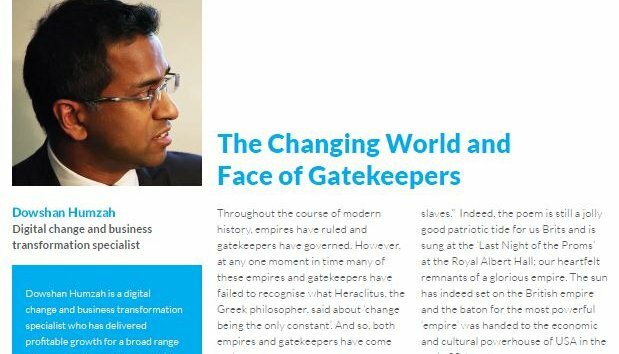 Throughout the course of modern history, empires have ruled and gatekeepers have governed. However, at any one moment in time many of these empires and gatekeepers have failed to recognise what Heraclitus, the Greek philosopher, said that ‘change is the only constant’. We have thus seen empires and gatekeepers flourish, change or disappear altogether. Indeed, the greatest (apologies, that’s my bias coming through) – I should say the largest empire in history was the British Empire. “Rule, Britannia! rule the waves: Britons never will be slaves.” The immortal words from the poem by James Thomson and images of privileged, well educated, white, British men building the empire may have set the tone for the original gatekeepers of the modern era. Indeed, the poem is still a jolly good patriotic rousing for us Brits and is sung at the ‘Last Night of the Proms’ at the Royal Albert Hall; our heartfelt reminiscences of a glorious empire. The sun has indeed set on the British Empire and the baton for the most powerful ‘empire’ was handed to the economic and cultural powerhouse of the USA in the early 20th century. Bob Dylan may have been prophesying when writing “The Times They Are A-Changin” back in the not too distant past (1964 to be exact: a time of mass social change post World War II). Dylan’s song became an anthem, especially for those involved with the civil rights and anti-war movements. The sentiments still resonate today with groups and organisations challenging gatekeepers and dominant forces. Even now, many are charting the decline of the USA as the leading global influence and the rise of the emerging market ‘superpowers’. These new ‘superpowers’ have realised opportunities by reaching out to their significant domestic population as their own spending power increases and improving connectivity via trade and digital. The world has become smaller, more accessible and crowded at the top. In the space of a decade, the Global 500 (the world’s 500 biggest corporations by revenue) has transformed. In 2004, the majority were North American (c.40%) with second place taken by western European companies. Now Asia is home to more Global 500 companies than North America. China alone (with 95 companies, c.20%) has more than UK, Germany and France combined. So it seems the sun is setting on another empire and change, indeed, is the only constant. Gatekeepers can be defined as those who control passage through a gate. If you were in this role, as a gatekeeper, who would you let through? People you knew, recognised, associated with or who looked like you? Or strangers? People who have a different point of view or speak to you in a foreign language? When discussing all aspects of diversity, inclusion and equality in modern society we tend to view gatekeepers as those maintaining the status quo and limiting ‘access to opportunity’: not quite embracing change as the only constant. Henri Tajfel, the psychologist, wrote about ’minimal group’ identities and became interested in the psychology of prejudice given his experiences in World War II. He stated that ‘us’ and ‘them’ identities can be easily developed and that the allocation of resources to members of one’s own group at the expense of others can take a much subtler form – yet still exact a high price on those who are not part of that ‘in group’. As a consequence, those in the privileged position of being similar to the gatekeepers constantly receive more help and privilege than those who are not. Potential gatecrashers suffer from the consequence of the gatekeepers’ inaction. As a result the status quo is maintained; change then is not the constant, for the time being. When viewing progression on the corporate ladder in USA or UK – gatekeepers, though not all necessarily ‘pale, stale and male’, are still characterised by privilege, social status and economic wealth. However, we have gatecrashers coming to the party as a result of social change, increased social mobility, an evolving world order and digital pervasiveness – all opening up new markets and opportunities. As previously stated gatekeepers generally limit ‘access to opportunity’ to those not like them or those who are deemed as not being part of the dominant ‘in groups’. By focusing on ‘access to opportunity’ I call for action to create a level playing field that allows individuals to progress their dreams and aspirations as well as supporting social mobility and equality. When we speak of the need for diversity, it is crucial to appreciate that is not just a case of championing minority interests or those from the ‘out groups’ — the advantages of diversity go to the majority and benefit all. There is increasing qualitative and quantitative evidence of diversity providing benefits from many perspectives: organisational effectiveness, societal, inclusion, fairness, business growth, strategic and financial. So, let me be clear – I only support ‘merit based diversity’ and inclusion; the best of the best from the widest possible groups should rise to the top based on merit not preference and we need a transparent and equal playing field for that – i.e. open ‘access to opportunity’ which in turn enriches society. For organisations and businesses, there is a need for leadership teams to evolve in order to better reflect new customer bases, emerging market opportunities and greater competition. As barriers come down, talent pools are broadening with increased access to education, opportunity and social mobility. For instance, women and minorities – gatecrashers in the politest terms possible – are increasingly challenging the status quo of gatekeepers. They are exercising their basic democratic right to vote; progressing in professions, blue-chip organisations and government – through to holding the highest office ‘in the land’. It is accepted that having a broad range of opinions and styles with open and robust debate generally results in better decision making. Therefore, diverse team composition in these respects (be it visible such as gender and race; or ‘invisible’ such as differences in background, experience, social status and thinking style) should lead to greater social and economic value. McKinsey & Company has recently presented compelling analysis showing a statistically significant relationship between more diverse leadership/teams and superior financial performance of corporations. The data set comprised of many hundreds of corporations from North America, Latin America and UK and correlated diversity (gender and race/ethnicity in leadership teams) with financial performance (average Earnings Before Interest and Tax (EBIT) for the period 2010-13). The size of the dataset provides confidence in the outcomes and has the rigour to be expected from McKinsey. The companies in the top quartile of gender diversity were 15% more likely to have above median financial returns relative to their national industry median. Companies in the top quartile of racial/ethnic diversity were 30% likely to have above median returns. When broken down, most relevant for UK plc and UK Gross Domestic Product was that companies with a 10% higher gender and racial/ethnic diversity on management teams and boards had EBIT that was 5.6% higher whilst in the US it was 1.1% higher. A pertinent conclusion from McKinsey was that the unequal performance across companies in the same industry and the same country implies that diversity is a competitive differentiator that shifts market share. Equally, McKinsey stated that “critical mass is required to drive decisions and impact”. For me, this further reinforces the need to build the talent pipeline and recruit and promote top talent on merit at all levels to support a better financial return as opposed to making ‘token appointments’, forcing quotas or as is the case with UK plc merely looking to reach gender targets via non-executives. One can admire leaders, sports stars and media personalities who have risen through the ranks whilst having to hide their true selves. A recent example is that of Tim Cook, CEO Apple, publishing an open letter coming out. In the letter he stated that being gay has given him a deeper understanding of what it means to be in the minority and provided a window into the challenges that people in other minority groups’ deal with every day. Whilst obvious physical aspects of gender and race cannot, in the main, be hidden – there are elements of our beliefs, background, personality and orientation that individuals may choose to hide in both the work environment and society at large to better fit with the gatekeepers. Tim Cook stated that he had been open with many people about his sexual orientation and that plenty of colleagues at Apple knew he was gay. However, he stressed that he had the good fortune to work at a company that loves creativity and innovation and knows it can only flourish when embracing people’s differences. Not everyone is so lucky. There is a view that it is harder to be yourself in certain industries. Some women, particularly in finance, have stated that they had to act in a ‘more masculine way’ to be accepted; some people who don’t drink have felt pressured to drink and attend certain work events since that is where senior managers can get to know aspiring talent. It is a shame that any minority would feel the need to hide ‘who they are’ and, in essence, ‘hang their personality on the coat hook outside of their office or workplace’ as opposed to bringing in all that richness and diversifying influences. The film, ‘Selma’, has brought to the fore once again the notion of gatekeepers and gatecrashers. Selma, as is well known, relates the true story of Dr Martin Luther King and the people of the civil rights movement marching over the Edmund Pettus Bridge from Selma to Montgomery in 1965 to highlight inequalities particularly with regard to voting rights for black people in USA. It is hard to believe that this is recent history – less than 50 years ago. Cynically, we may reflect on the lack of recognition given to the movie and its lead actor by the gatekeepers of various award ceremonies (such as the Oscar academy) who may not have felt a resonance or not been comfortable with the portrayal of gatekeepers (many like them) in Selma. However, a message from Selma to the generation of today is that the people, regardless of status, background or any other grouping, should be the gatekeepers and the purveyors of true power as opposed to it residing in the hands of the few or the privileged. On winning the Oscar for Best Song in a Motion Picture with John Legend, , the rapper Common said: “Recently John and I got to go to Selma and perform Glory (the lead song) on the same bridge that Dr King and the people of the civil rights movement marched on 50 years ago. This bridge was once a landmark of a divided nation, but now is a symbol for change. The spirit of this bridge transcends race, gender, religion, sexual orientation and social status.” All of the people belonging to these ‘minority’ groups can be viewed as gatecrashers exercising their democratic right for equality and inclusion to be on a par with the then (and, to some extent, the current) gatekeepers. Richard Branson, founder of the Virgin group of companies and a renowned business gatecrasher upsetting many traditional business leaders and industry dynamics, observed that many of the 2015 Oscar winners’ speeches focused on and reflected the times we live in and challenges of many minority or disadvantaged groups. Perhaps the ultimate and best known gatecrasher of recent times is President Obama. One always assumes that in elections in a democracy there are no gatekeepers – just the power of the people; However selection committees, due process, media coverage, financial support and, of course, voters’ own bias all act as ‘gates’. In 2008, 43 years after Selma, the US electorate chose Barack Hussein Obama (I stress the non-European nature of his name) – a black man, with African roots and an ‘Islamic name’ to be its 44th President. Indeed, Barack Hussein Obama could only just be classed as ‘privileged’ given his elite education at Colombia university and Harvard law school and ‘traditional’ in his career as a Law Professor and then Senator. However, these were meritocratic achievements and allowed him to mix with traditional gatekeepers. Coupled with a degree of mastery, funding and charisma he was able to engage with the gatekeepers and electorate to be elected and also serve a second term. Thank you, Mr President (and grandson of a Kenyan who served as a cook in the British Army). That is why ‘access to opportunity’ is so important and how gatecrashers can make an impact challenging the status quo of their former colonial gatekeepers. ‘Access to opportunity’ is used by the author to describe the phenomenon of limiting progress and social mobility to certain ‘in groups’ via barriers to entry.